Starts today! Who's with me! I want to join! I love these! 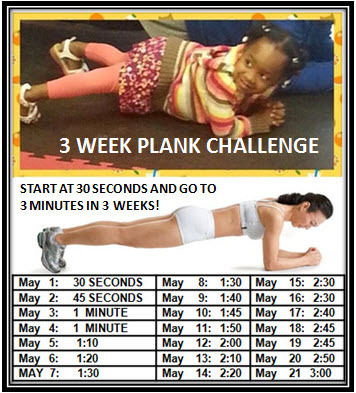 Here is the original plank challenge that Cindy had. Just wanted to bring it forward. I would love to give this another try. I was doing this and the squat challenge that was circulating around facebook a while ago. There is no way I can start at 30 seconds on the first day and move to 40 on the second day though. I will probably collapse after 15 seconds. So I will do my own modified version of the chart. I do remember how much the plank engaged much of the body! Thanks, Pink, you're the bomb! Since everyone always talks about this and 17620 days ago it was posted, I am up for the challenge. Now that I am 240lbs I think I might be able to lift my body. I have been doing a lot of floor exercises so I might as well, I have nothing to lose but try to see if I can do it. anyway want to TRY! With me and make it a Full MONTH (NOT) Missing One Day! Put a check mark right after you have done your Plank. Lets fill this POST UP! With Check Marks for 30days!